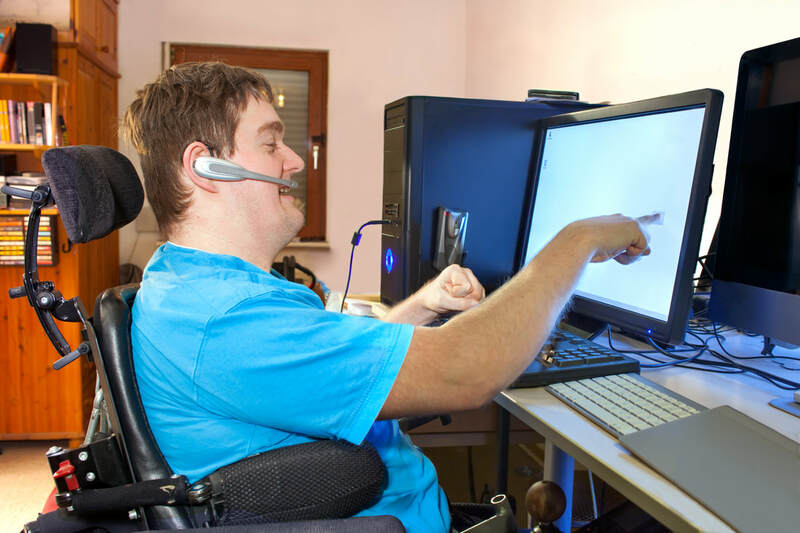 Assistive technology (AT) has been defined as any item, device, or system, whether purchased, customized or fabricated, that can be used to improve the functional capabilities of an individual with a disability. AT solutions can range from low-tech (simple) to high-tech (complex), depending on the unique needs of the individual. For example, one person might need to add foam to pencil to make it easier to use, while another person requires a specialized computer system in order to "write". 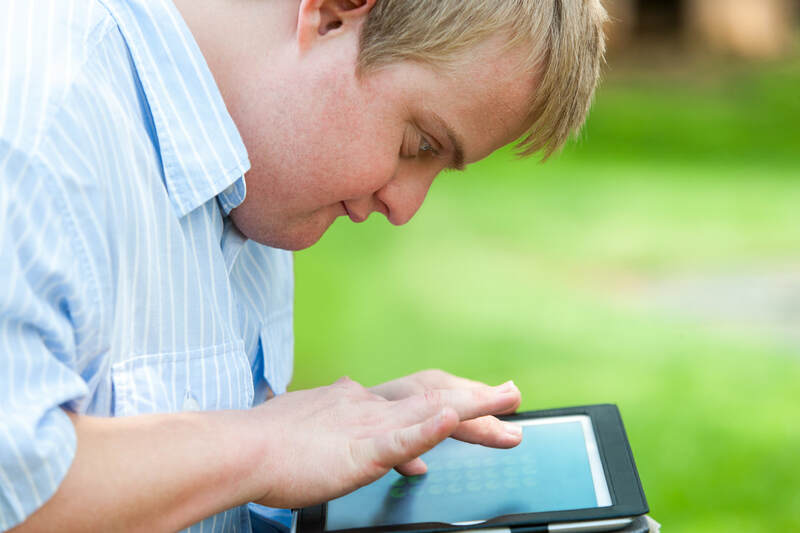 Young man using computer touch screen and voice recognition. Using a communication app on a tablet. ​The AT Resource & Education Center has entered a formal collaboration with the Adirondack Regional Technology Center at SUNY Plattsburgh, one of the 12 regional TRAID Centers. As a TRAID satellite location, our facility maintains an inventory of AT devices that are available for demonstrations and short-term loans. Opportunities for hands-on exploration and short term trials can help ensure a good fit between an AT device and it's user's needs, preferences and priorities. If you'd like to learn more about AT, explore devices in our library, or discuss a short term loan, please contact us at 315-268-5981. Clarkson Univeristy OT Program's logo. Master of Science in Occupational Therapy. OT students demonstrating mid-tech communication devices. The Assistive Technology Resource & Education Center (ATREC) is a project of the Clarkson University's Occupational Therapy Program in Potsdam, NY. Our facility is under the direction of Dr. Lisa Tebo, who is faculty in the Clarkson OT Program. The ATREC is staffed by graduate students Christie, Tori, Kiley and Rebecca, who can assist community members with resources, device demonstrations, and AT loans, as well as Alex, who can assist community members in utilizing our 3D printers to fabricate simple adaptive devices. Contact us to schedule a visit!